The Black Deer Festival, set for June 22-24, has added Sarah Darling, Jess and The Bandits, Robert Vincent, Steak, O&O, Noble Jacks, Jay Scott, Ilona, Tally Spear and Katy Hurt to its 2018 lineup. These new artists join the already announced lineup that includes Jason Isbell and the 400 Unit, Kiefer Sutherland, Ashley Campbell, Sam Palladio, Wade Bowen, and many more for the festival’s inaugural year. 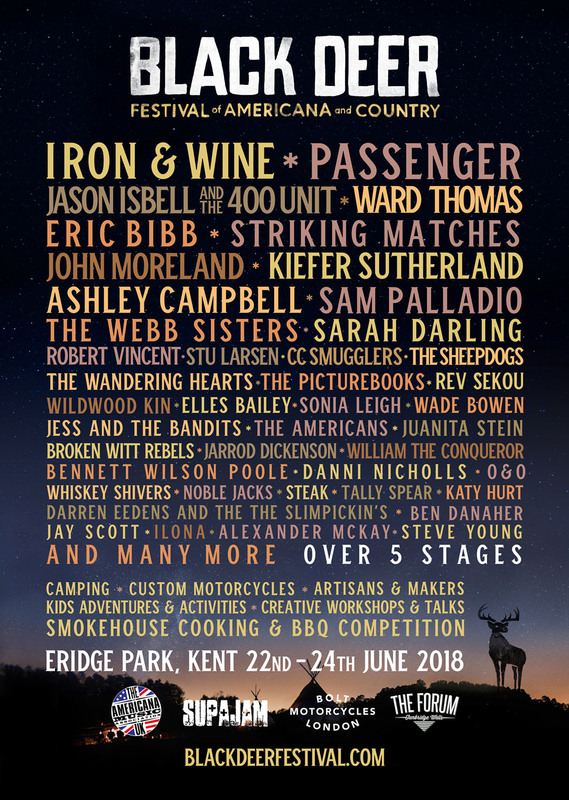 Black Deer is an independent festival set to take place in the natural outdoor location of Eridge Park, Britain’s oldest deer park located on the Kent/East Sussex border near Tunbridge Wells 50 minutes outside of London. The festival will immerse attendees in the alternative lifestyle with authentic Americana-style meats, smokey whiskeys, custom motorcycle showcases and storytellings from cultural pioneers. Previously announced artists set to perform at Black Deer include Iron & Wine, Passenger, Jason Isbell & the 400 Unit (UK Festival Exclusive), Ward Thomas, Eric Bibb, Striking Matches, John Moreland, Kiefer Sutherland, Ashley Campbell, Sam Palladio, The Webb Sisters, Stu Larsen, CC Smugglers, The Sheepdogs, The Wandering Hearts, The Picturebooks, Rev Sekou, Wildwood Kin, Elles Bailey, Sonia Leigh, Wade Bowen, The Americans, Juanita Stein, Broken Witt Rebels, Jarrod Dickenson, William the Conqueror, Bennett Wilson Poole, Danni Nicholls, Whiskey Shivers, Darren Eedens and the Slim Pickin’s, Ben Danaher, Alexander McKay. and Steve Young.